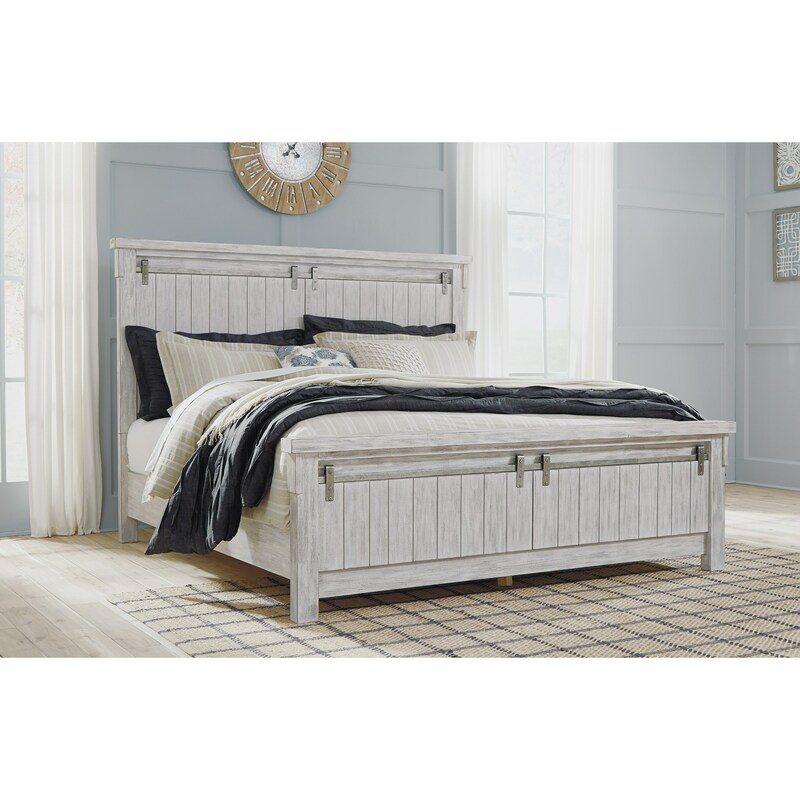 The planked wood design of this king bed, coupled with the accenting metal hardware, give this piece a farmhouse fresh look that will effortlessly transform the feel of your bedroom. The white rub-through finish contributes to the relaxed vintage style this piece draws its inspiration from, and thanks to its durable construction, this bed will serve you well for years to come. The Brashland Relaxed Vintage King Panel Bed by Signature Design by Ashley at Miskelly Furniture in the Jackson, Pearl, Madison, Ridgeland, Flowood Mississippi area. Product availability may vary. Contact us for the most current availability on this product. Handles & Hardware Industrial bar pulls with square back plates finished in a brushed nickel color. Create a farmhouse chic ambiance in your home with this stunning bedroom collection. Design features such as rub-through finishes, planked wood, and barn door hardware give this collection its distinct relaxed vintage vibe that can be appreciated for years to come. The Brashland collection is a great option if you are looking for Relaxed Vintage furniture in the Jackson, Pearl, Madison, Ridgeland, Flowood Mississippi area. Browse other items in the Brashland collection from Miskelly Furniture in the Jackson, Pearl, Madison, Ridgeland, Flowood Mississippi area.